Azure provides built-in diagnostics to assist with debugging an App Service app. In this article, you learn how to enable diagnostic logging and add instrumentation to your application, as well as how to access the information logged by Azure. This article uses the Azure portal and Azure CLI to work with diagnostic logs. For information on working with diagnostic logs using Visual Studio, see Troubleshooting Azure in Visual Studio. App Service provides diagnostic functionality for logging information from both the web server and the web application. These are logically separated into web server diagnostics and application diagnostics. 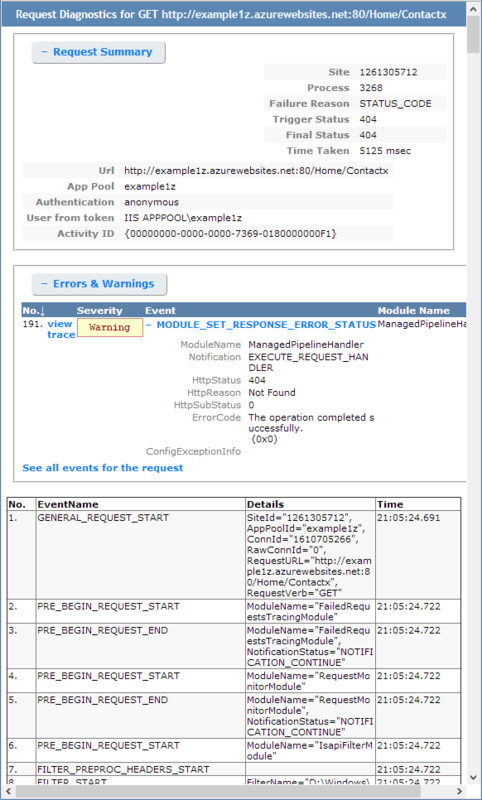 Detailed Error Logging - Detailed information for any request that results in HTTP status code 400 or greater. It may contain information that can help determine why the server returned the error code. One HTML file is generated for each error in the app's file system, and up to 50 errors (files) are retained. When the number of HTML files exceed 50, the oldest 26 files are automatically deleted. Failed Request Tracing - Detailed information on failed requests, including a trace of the IIS components used to process the request and the time taken in each component. It's useful if you want to improve site performance or isolate a specific HTTP error. One folder is generated for each error in the app's file system. File retention policies are the same as the detailed error logging above. Web Server Logging - Information about HTTP transactions using the W3C extended log file format. It's useful when determining overall site metrics such as the number of requests handled or how many requests are from a specific IP address. At runtime, you can retrieve these logs to help with troubleshooting. For more information, see Troubleshooting Azure App Service in Visual Studio. App Service also logs deployment information when you publish content to an app. It happens automatically and there are no configuration settings for deployment logging. Deployment logging allows you to determine why a deployment failed. For example, if you use a custom deployment script, you might use deployment logging to determine why the script is failing. To enable diagnostics in the Azure portal, go to the page for your app and click Settings > Diagnostics logs. For Application logging, you can turn on the file system option temporarily for debugging purposes. This option turns off automatically in 12 hours. You can also turn on the blob storage option to select a blob container to write logs to. Currently only .NET application logs can be written to the blob storage. Java, PHP, Node.js, Python application logs can only be stored on the file system (without code modifications to write logs to external storage). For Web server logging, you can select storage or file system. Selecting storage allows you to select a storage account, and then a blob container that the logs are written to. If you store logs on the file system, the files can be accessed by FTP, or downloaded as a Zip archive by using Azure CLI. By default, logs are not automatically deleted (with the exception of Application Logging (Filesystem)). To automatically delete logs, set the Retention Period (Days) field. In the Configure tab, set the respective logging feature to Off. Save your setting. Enable logging to the storage account blob again. Save your setting. Any combination of file system or blob storage can be enabled at the same time, and have individual log level configurations. For example, you may wish to log errors and warnings to blob storage as a long-term logging solution, while enabling file system logging with a level of verbose. While both storage locations provide the same basic information for logged events, blob storage logs additional information such as the instance ID, thread ID, and a more granular timestamp (tick format) than logging to file system. Information stored in blob storage can only be accessed using a storage client or an application that can directly work with these storage systems. For example, Visual Studio 2013 contains a Storage Explorer that can be used to explore blob storage, and HDInsight can access data stored in blob storage. You can also write an application that accesses Azure Storage by using one of the Azure SDKs. Diagnostic information stored to the app file system can be accessed directly using FTP. It can also be downloaded as a Zip archive using Azure CLI. Application logs - /LogFiles/Application/. This folder contains one or more text files containing information produced by application logging. Failed Request Traces - /LogFiles/W3SVC#########/. This folder contains an XSL file and one or more XML files. Ensure that you download the XSL file into the same directory as the XML file(s) because the XSL file provides functionality for formatting and filtering the contents of the XML file(s) when viewed in Internet Explorer. Detailed Error Logs - /LogFiles/DetailedErrors/. This folder contains one or more .htm files that provide extensive information for any HTTP errors that have occurred. Web Server Logs - /LogFiles/http/RawLogs. This folder contains one or more text files formatted using the W3C extended log file format. Deployment logs - /LogFiles/Git. This folder contains logs generated by the internal deployment processes used by Azure App Service, as well as logs for Git deployments. You can also find deployment logs under D:\home\site\deployments. 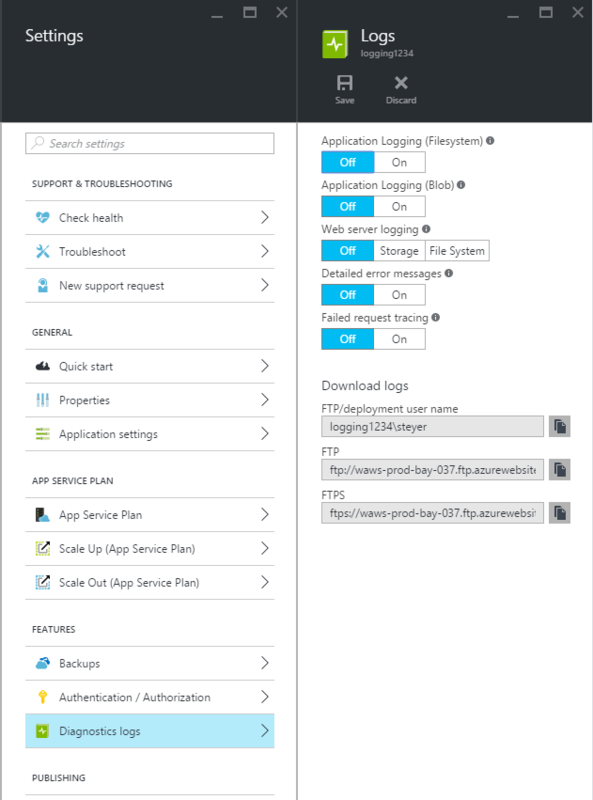 To open an FTP connection to your app's FTP server, see Deploy your app to Azure App Service using FTP/S. Once connected to your app's FTP/S server, open the LogFiles folder, where the log files are stored. This command saves the logs for the app named 'appname' to a file named webapp_logs.zip in the current directory. If you haven't installed Azure CLI, or haven't configured it to use your Azure Subscription, see How to Use Azure CLI. Visual Studio Application Insights provides tools for filtering and searching logs, and for correlating the logs with requests and other events. Add the Application Insights SDK to your project in Visual Studio. Add the Trace Listener package to your project. Upload your project and run it to generate log data. While developing an application, it is often useful to see logging information in near-real time. You can stream logging information to your development environment using Azure CLI. Some types of logging buffer write to the log file, which can result in out of order events in the stream. For example, an application log entry that occurs when a user visits a page may be displayed in the stream before the corresponding HTTP log entry for the page request. Log streaming also streams information written to any text file stored in the D:\home\LogFiles\ folder. This command connects to the app named 'appname' and begin streaming information to the window as log events occur on the app. Any information written to files ending in .txt, .log, or .htm that are stored in the /LogFiles directory (d:/home/logfiles) is streamed to the local console. Application diagnostics stores information in a specific format for .NET applications, depending on whether you store logs to the file system or blob storage. The base set of data stored is the same across both storage types - the date and time the event occurred, the process ID that produced the event, the event type (information, warning, error), and the event message. Using the file system for log storage is useful when you need immediate access to troubleshoot an issue because the log files are updated near instantaneously. Blob storage is used for archival purposes because the files are cached and then flushed to the storage container on a schedule. 2014-01-30T16:36:59  PID Error       Fatal error on the page! Logging to the file system provides the most basic information of the three available methods, providing only the time, process ID, event level, and message. For ASP.NET Core, logging is accomplished using the Microsoft.Extensions.Logging.AzureAppServices provider This provider deposits additional log files into the blob container. For more information, see ASP.NET Core logging in Azure. An easy way to view the formatted failed request traces is to navigate to your app's page in the portal. From the left menu, select Diagnose and solve problems, then search for Failed Request Tracing Logs, then click the icon to browse and view the trace you want. Detailed error logs are HTML documents that provide more detailed information on HTTP errors that have occurred. Since they are simply HTML documents, they can be viewed using a web browser. The web server logs are formatted using the W3C extended log file format. This information can be read using a text editor or parsed using utilities such as Log Parser. The logs produced by Azure App Service do not support the s-computername, s-ip, or cs-version fields.